Scope: New construction of seven buildings, 3-story residential style wood frame construction, (50 units) containing 8 one-bedroom units, 34 two-bedroom units, and 8 three-bedroom units for rental use. Additionally, 33 parking spaces and site improvements were constructed. 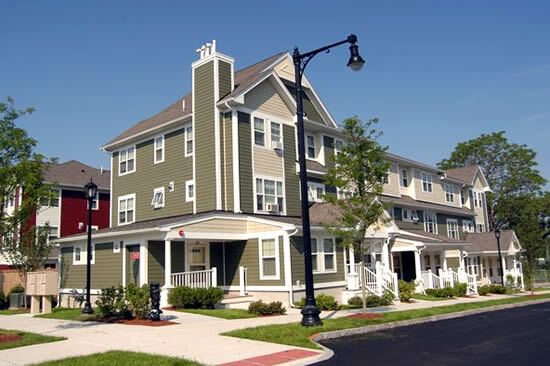 “After the successful completion of Olmsted Green Rental I, Lena New Boston looked to Bilt-Rite to manage the construction of the second Phase of the development. The construction of the rental housing component at Olmsted Green continues to yield successful results for both the Owner and the Community it serves. As in Phase I, we have delivered on the measurable financial goals of substantial shared owner savings, while achieving substantial completion 36 days ahead of schedule. In addition we have also met the lofty community goals by building the project with 50% M/WBE companies while achieving an impressive 68% Minority, 55% Boston Resident workforce during construction.